Bring on the tropical flavors this summer with this wonderful sweet and spicy and tangy combo of Ginger Tamarind Shrimp with Pineapple Salsa! Putting together this Ginger Tamarind Pineapple flavor combination was a no brainer for me when I was thinking of something tropical for the beautiful shrimp that I had. I wanted to grill them and was leaning towards a marinade that can be used as a basting sauce as well to kinda reinforce the flavors into the shrimp as they cooked. With the pineapple salsa as the topping, I wanted to incorporate some amount of sweetness in the sauce as well, so the shrimp carries that through along with the heat from the ginger and cayenne and the sourness from the tamarind. So I added a little bit of date sugar to the marinade mix and it just worked wonders. You can always add brown sugar if you don’t have date sugar. I loved this idea of working with flavor profiles that I know will work, those that have worked in different kind of dishes so far and to try it out with a totally different style of cooking. A lot of times that could be a huge gamble that fails but a lot of times it works as well. This was one such time and it was such a huge hit. We had some leftovers and took them to a picnic we had with friends and everyone loved it. Click here or scroll down to see details for an exciting giveaway! The La Victoria brand of Pineapple salsa worked as a great topping to bring together the tropical flavors in it. I can’t wait to get my hands on their new Mango Habanero Salsa that totally screams success of the sweet and spicy flavor combo that is sought after this summer season, especially to wash down with a nice chilled beer while barbecuing. Did you know that LA VICTORIA® salsa brand is currently running a social giveaway called “View My Plate” . You could be the lucky one to win a Classic Four Burner Gas Grill (valued at up to $500) this summer! Click here or the image below to see details. 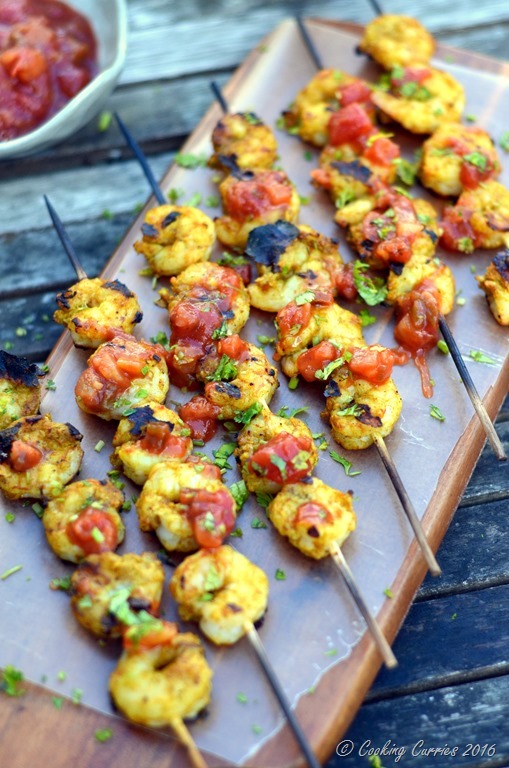 Meanwhile enjoy my take on a sweet and spicy summer recipe with these Ginger Tamarind Shrimp with Pineapple Salsa. Add 1/2 cup water to the tamarind, soak for a few minutes and squeeze out all the pulp and strain. In a sauce pan on medium heat, cook together the tamarind pulp, grated ginger, salt, cayenne, sugar and turmeric powder. Cook till it all comes to a boil and then simmer for 3-4 minutes. Let it cool and pour over the cleaned shrimp. Let marinate for 5-10 minutes. 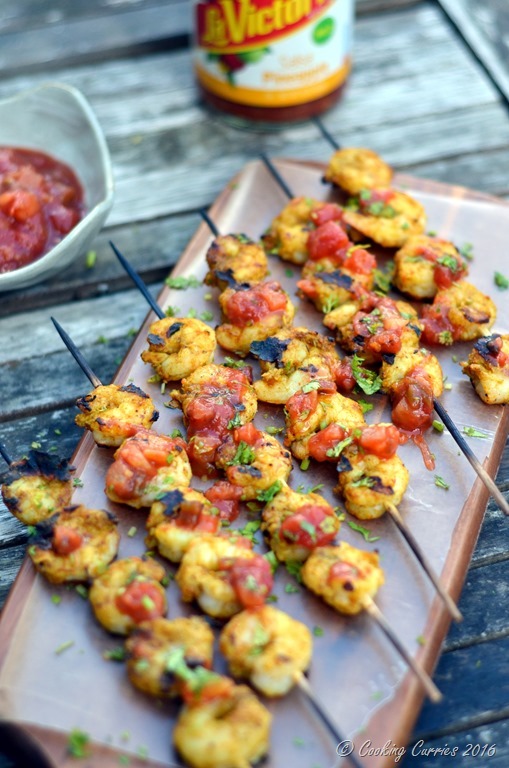 Thread the shrimp over skewers and heat up your grill. Spray the grill with non stick cooking spray and arrange the skewers on it. Cook on one side for 3-4 minutes and turn over. Baste with the tamarind ginger marinade that was left over in the bowl and grill for another 3 minutes. Remove from the grill onto a serving platter. 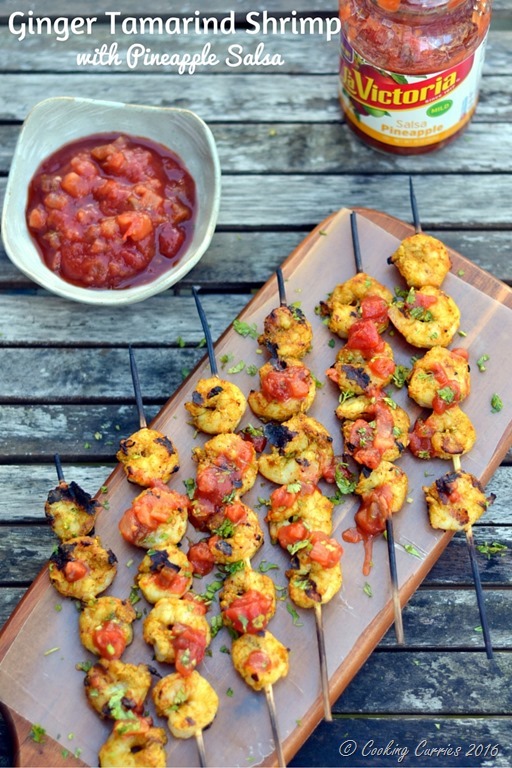 Drizzle the LA VICTORIA® Brand Pineapple Salsa over the shrimp skewers and garnish with minced cilantro. Stunning blog post! Beautiful photos that jump right out at you and make your mouth water! Totally loving your giveaway too.